Water sets up in as little as 12 hours and not more than 24, depending on the atmospheric conditions. Each carton of Magic Water contains enough resin (18 ounces) to make any average-sized project. It comes complete with a multi-page color booklet and instruction guide loaded with water modeling tips and techniques on making ponds, lakes, streams, rivers, rapids, waterfalls, swamps, swimming pools, mud puddles, and more! 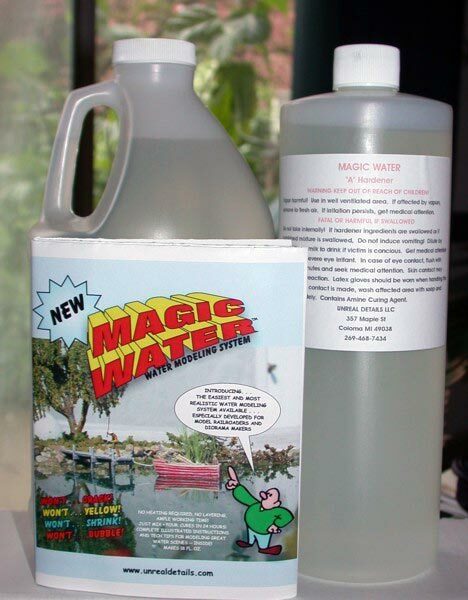 We are sure you will find Magic Water to be the easiest and most realistic product you have tried.